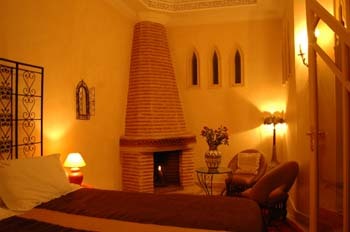 Each room at Riad Amira Victoria has its own bathroom and toilet, and there a nice roof terrace where all guests may relax and unwind. 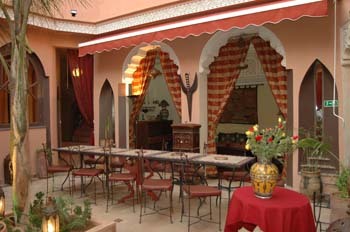 Some guests may wish to enjoy their meals on the terrace. Airport pick-up can be arranged if required. Prior notification is important (we will need your flight number with your arrival time) someone of our team will be waiting for you at the airport with a sign with your name. The eleven bedrooms are very large and some even have private fireplaces. They all have air-conditioning, direct access to the patios and terrace. The enormous space on the terrace has been organized into different spaces: a Berber tent, shower areas, sun decks and salons with various themes, all from which you can take advantage of the very privileged view of Marrakech and its surroundings. SUITES : Suite n°4 A large suite on the first floor overlooking the patio and the fountain, bright and cool. Equipped with a big bed covered with a canopy, the living-room space is in front of the chimney it has two chairs, cupboard, spacious bathroom with a tadelakt shower, bathrobes and linen for customers. Air-conditioned... Type of bedroom : suite for 2 people. Number maximum of people : 2. Suite n°7 A large suite on the first floor overlooking the patio, bright. Equipped with a big bed covered with a canopy, the living-room space is in front of the chimney it has two chairs, cupboard, spacious bathroom with a tadelakt shower, bathrobes and linen for customers. Air-conditioned... Type of bedroom : suite for 2 people. Number maximum of people : 2. Suite n°9 A large suite on the first floor, overlooking the patio, bright and cool. Equipped with a big bed, the living-room space is in front of the chimney it has a two chairs, cupboard, and spacious bathroom with a tadelakt shower, bathrobes and linen for customers. Air-conditioned... Type of bedroom : Suite for 2 people. Number maximum of people : 2. Suite n°11 A large suite on the ground floor overlooking the patio, bright and cool. Equipped with a big bed, the living-room space is in front of the chimney it has two chairs, cupboard, spacious bathroom with a tadelakt shower, bathrobes and linen for customers. Air-conditioned... Type of bedroom : suite for 2 people. Number maximum of people : 2. TWIN ROOMS : Room n°1 A large room on the ground floor, overlooking the patio and the fountain, bright and cool. 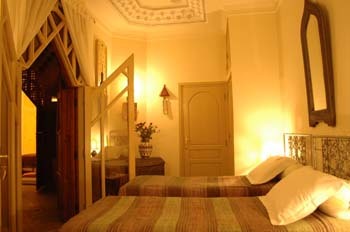 Equipped with two simple beds, cupboard, and bathroom with a tadelakt shower, bathrobes and linen for customers. Air-conditioned... Type of bedroom : Room for 2 people. Number maximum of people : 2. Room n°8 A large room on the first floor, overlooking the patio, bright and cool. Equipped with two simple beds, the living-room space has two chairs, cupboard, and bathroom with a tadelakt shower, bathrobes and linen for customers. Air-conditioned... Type of bedroom : Room for 2 people. Number maximum of people : 2. Room n°10 A large room on the ground floor, overlooking the patio, bright and cool. Equipped with two simple beds, the living-room space has two chairs, cupboard, and bathroom with a tadelakt shower, bathrobes and linen for customers. Air-conditioned... Type of bedroom : Room for 2 people. Number maximum of people : 2. DOUBLE ROOMS : Room n°2 A large room on the ground floor overlooking the patio and the fountain, bright and cool. Equipped with a big bed, the living-room space is in front of the chimney it has two chairs, cupboard, and spacious bathroom with a tadelakt shower, bathrobes and linen for customers. Air-conditioned... Type of bedroom : Room for 2 people. Number maximum of people : 2. Room n°3 A large room on the ground floor overlooking the patio and the fountain, bright and cool. Equipped with a big bed, the living-room space is in front of the chimney it has a seat which can be convert to an extra bed, cupboard, and spacious bathroom with a tadelakt shower, bathrobes and linen for customers. Air-conditioned... Type of bedroom : Room for 2 or 3 people "Triple on request". Number maximum of people : 3. Room n°5 A large room on the first floor, with a balcony, overlooking the patio and the fountain, bright. Equipped with a big bed, the living-room space is in front of the chimney it has a seat which can be convert to an extra bed, cupboard, and spacious bathroom with a tadelakt shower, bathrobes and linen for customers. Air-conditioned... Type of bedroom : Room for 2 people. Room n°6 A large room on the first floor, with a balcony, overlooking the patio and the fountain, bright and cool. Equipped with a big bed covered with a canopy, chimney, cupboard, and spacious bathroom with a tadelakt shower, bathrobes and linen for customers. Air-conditioned... Type of bedroom : Room for 2 people. Number maximum of people : 2. 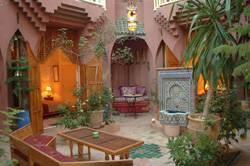 A stones throw from the Marrakech museum and the Mederasa Ben Youssef, a genuine haven of peace and quiet, Riad Amira Victoria, welcomes you in from the hustle and bustle of the souks. 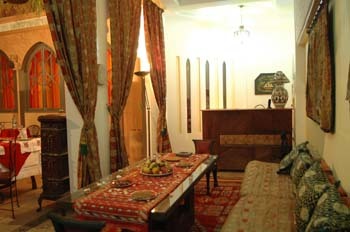 Indeed, a beautiful home which has been entirely restored to cater to your every need. The original labyrinth style architecture with Moorish lines symbolizing the epitome of traditional Moroccan art, combines perfectly with the modern comfort you expect from a fine hotel. 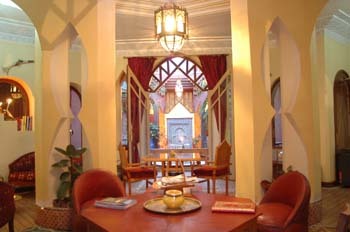 In case of cancellation the customer must inform the Riad, cancellations must be made in writing, sent by post or fax to our Riad. - Over 15 days before the arrival date 50% of the total amount of your stay. - From 10 to the arrival day 100% of the total amount of your stay. - No Show : 100% of the total amount of your stay. * Please note : Payment by credit card is possible but there is 5% of bank charges.